Alicia Roman has the latest forecast update after a snowy morning will quickly turn into a bitter blast. Snow blanketed the Chicago area early Monday, as the region remained under a Winter Weather Advisory. Lake, McHenry, De Kalb and La Salle counties in Illinois were under a Winter Weather Advisory through 9 p.m. Monday, while Cook, DuPage, Grundy, Kane, Kankakee, Kendall and Will counties in Illinois, plus Jasper, La Porte, Lake, and Newton counties in Indiana were under a Winter Weather Advisory through midnight. Kenosha County in Wisconsin was under a Winter Storm Warning through 6 p.m. CST Monday, according to the National Weather Service, which warned of heavy snow through the morning with accumulations of 6 to 8 inches, plus freezing drizzle resulting in an icy glaze. Heavy snow began falling in the northern suburbs late Sunday, blanketing the area by early Monday ahead of the morning commute. Some northern areas could see three to six inches of snow, while areas further south could see a mix of precipitation that could create icy road conditions for travelers during the morning and evening commutes. Even after that weather system moves out of the area, residents will have to deal with a different threat: bitter cold. 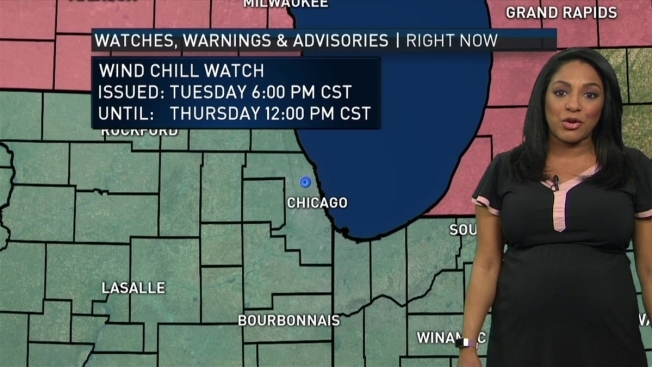 Temperatures will plunge on Tuesday and into Wednesday, with wind chills potentially dropping to 35 to 50 degrees below zero in some locations. In fact, Wednesday has the potential to be one of the coldest days in Chicago history with a projected high temperature of -8 degrees. The lowest high temperature in Chicago history came in January 1994, when the mercury only rose to -11. The coldest high temperature on January 30 in Chicago history is three degrees above zero, so the area could smash several cold-related records in the coming days.